Whatever your preferred activity, you'll never have to settle for just one map. Find your position on up-to-date DeLorme Topo USA 9.0 maps (included). Navigate worry-free with complete U.S. topographic detail, extensive trail coverage, U.S. and Canada streets, roads, and places of interest including campgrounds, boat launch sites, unique natural features, prime hunting and fishing spots. 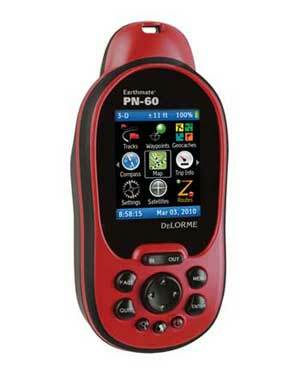 The PN-60 comes with up-to-date DeLorme Topo USA 9.0 map detail included, both on PN-Series Map DVDs (Mac-compatible) for transfer to the GPS, and in a PC desktop software program. The PN-60 supports all popular outdoor activities. Features include a highly-accurate 3-axis electronic compass that works when held in any position, moving on foot or standing still. For traveling in elevation, there is an elevation profile tool that pinpoints your location and a sensitive barometric altimeter for precise elevation readings and the ability to gauge potential weather changes. These elevation features are particularly useful for hikers, climbers, and hunters. The ability to display NOAA nautical charts make the PN-60 a valuable navigator for sea kayaking and coastal sailing. The PN-60 fully supports paperless geocaching, and offers almanac pages with information on tides, hunting and fishing favorability, and sunrise/sunset and moon phases. Individual caches can be downloaded, with all information included, from Geocaching.com. The PN-60 and Topo USA also support imports of high volume Pocket Queries from Geocaching.com, and they allow virtually unlimited cache description character counts, so you'll have all the information you need on the device, including other cachers' log notes. The optional DeLorme Cache Register download delivers enhanced paperless geocaching functions. Sync your Pocket Query search results directly to the PN-60, and sync your user logs and other cache details to Geocaching.com. DeLorme is the innovation leader in high-quality maps and GPS units for everyone from recreational customers to businesses to government agencies. Proven in the most extreme conditions, from the bitter cold of the North Pole and Mt Everest to the heat and sand of Iraq and Afghanistan, DeLorme products are well known for rock-solid design, accuracy, and reliability. DeLorme is a disabled veteran-owned small business (SDVOSB) and takes great pride in engineering outstanding maps, software, and GPS units right here in the United States.